» A.C. Cobra 427 turbo..
A few months ago I started a poll and let the members of OWN decide what commission I would do from Krexx and the Cobra sniper won that poll. 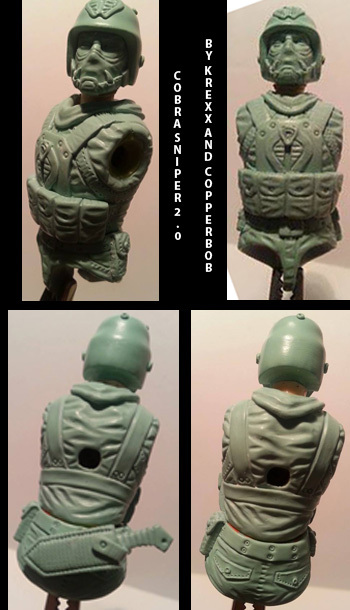 I just received images of the Cobra sniper from Krexx and they look even better than the one shown on the poll. I sent Rambo some of the images to share with the members. I did this as my gift to the members and with the hope that it would reestablish trust on this site. My hope is that the members would now see it doesnt take much effort or money to get exciting new O-Ring parts if everyone works together. I'm not going to push getting new parts or donations towards new parts from the members because I have been doing personal commissions since January which now include the Storm Shadow, Cobra sniper, Jungle shirt Kwinn, Zanya and comic accurate October Guard Daina which I'm paying krexx for in the next couple of days. I hope the members will go back to the days this site first started and do a poll and vote on new parts. I will donate towards any project started by this site as a member. I hope everyone that buys a sniper enjoys it as much as I will. I havent worked out the details yet on how the sniper will be sent out. Either Krexx will handle it directly or I will take the orders and send payment to Krexx who will then send me the parts to mail out. If it is the second option I would have to consider how much postage is to mail out the parts. Thank you for your work in the background, and of course the help of Krexx, finally, we're going to have a hassle-free new addition. I hope that another poll will began soon. » Looking for a Gunze Cobra Daytona.